DCHS Winter Baseball Clinic will be held on March 2nd in Dowling’s main gym. Cost is $45.00 and includes a t-shirt. Click here to sign up. Cost is $60. Click here to sign up. 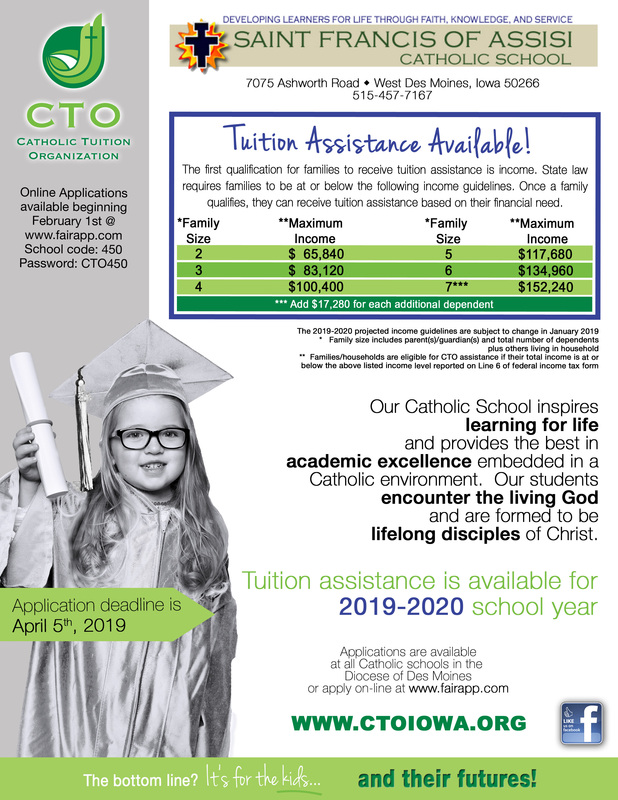 2019-2020 Tuition Assistance Applications (CTO) are available starting February 1st. Application deadline is April 5th. Go to fairapp.com use School Code: 450, Password: CTO450 to apply. Please note: Your child would not be at the rehearsals the entire time on either of these days. Once cast, we expect 1-2 hours on Tuesdays and 45 minutes on Saturdays. We are happy to discuss working around sports and dance competition schedules. This is a great way to build confidence and speaking skills. Click here for more information or contact Lisa Wagner or 773-263-2007. SAVE THE DATE: Vacation Bible School 2019: June 24- 28, 2019 from 9a-12p. Registration will take place in March. If you have any questions about VBS, please call the Faith Formation Office at 515-440-1030.